2009 Nga Kete Wananga marae, MIT. Itenary Thurs 16 April 8.55amPohiri 9.30amPresentation 1:Taina Pohatu Group workshop Q1? 10.15amMorning tea 10.30amPresentation. 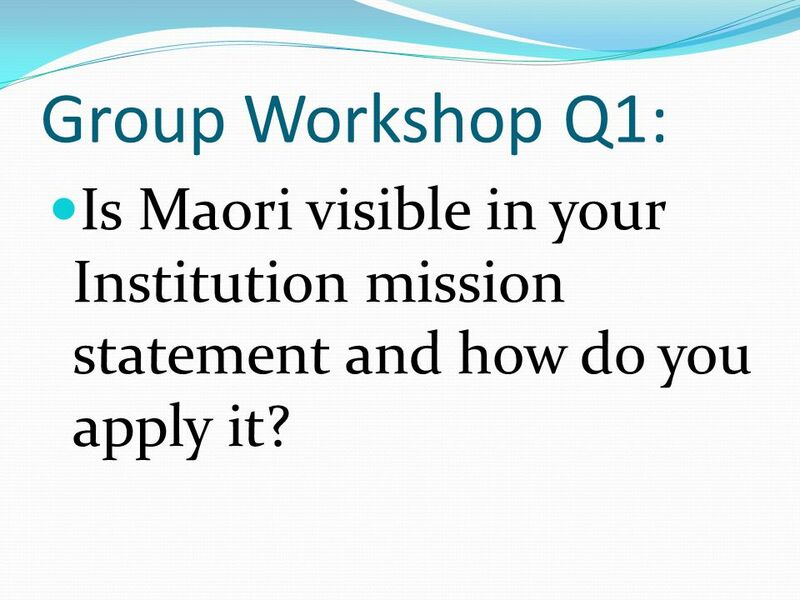 4 Group Workshop Q1: Is Maori visible in your Institution mission statement and how do you apply it? 5 Frank Solomon M.A. Hons, Dip Ed, Dip Tchg Managing Director of The Solomon Group. Based in Manurewa, Auckland. The Solomon Group was awarded the Best Small Business at the 2005 Māori Business Awards. Another former secondary schools principal, now volunteering his time and expertise to youth mentoring so that opportunities for young people can be improved. Frank is Managing Director of the Solomon Group, an Educational and Training Academy with premises at Manurewa and Panmure and Chair of Te Manuka - 28 Maori PTEs in Tamaki-makaurau/ Auckland. The Solomon group are the lead provider of Youth Transition Services in Manukau, with subcontracted organisations in Manurewa and Mangere. 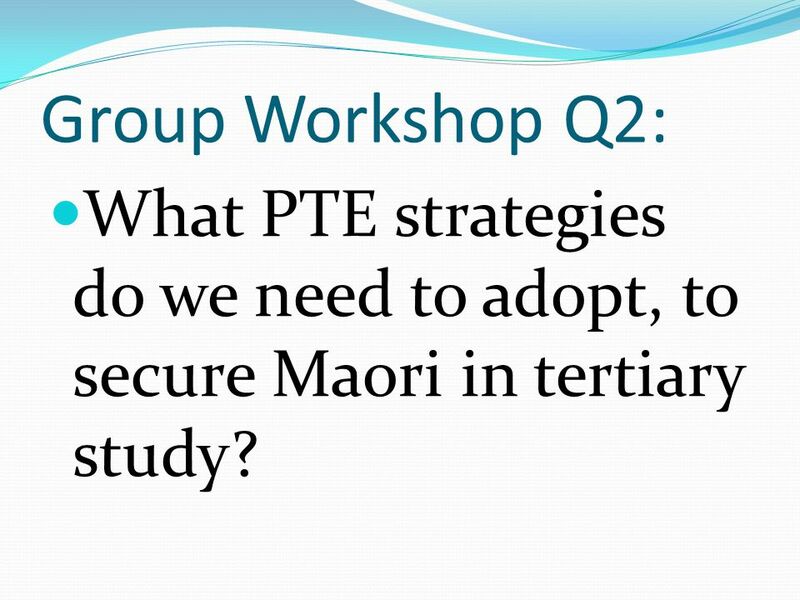 6 Group Workshop Q2: What PTE strategies do we need to adopt, to secure Maori in tertiary study? 7 Group Workshop Q3: What strategies do you have operating in your Institution and how do you know they are affective? 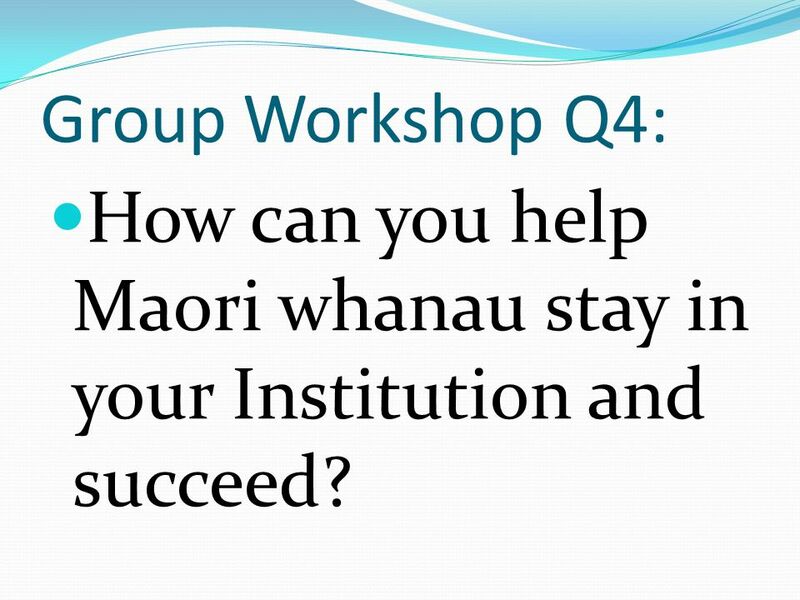 8 Group Workshop Q4: How can you help Maori whanau stay in your Institution and succeed? 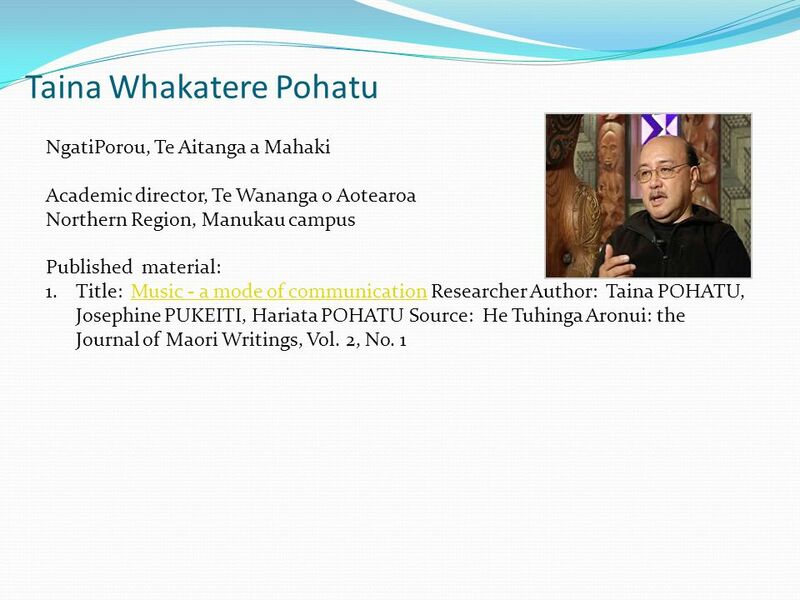 Download ppt "2009 Nga Kete Wananga marae, MIT. 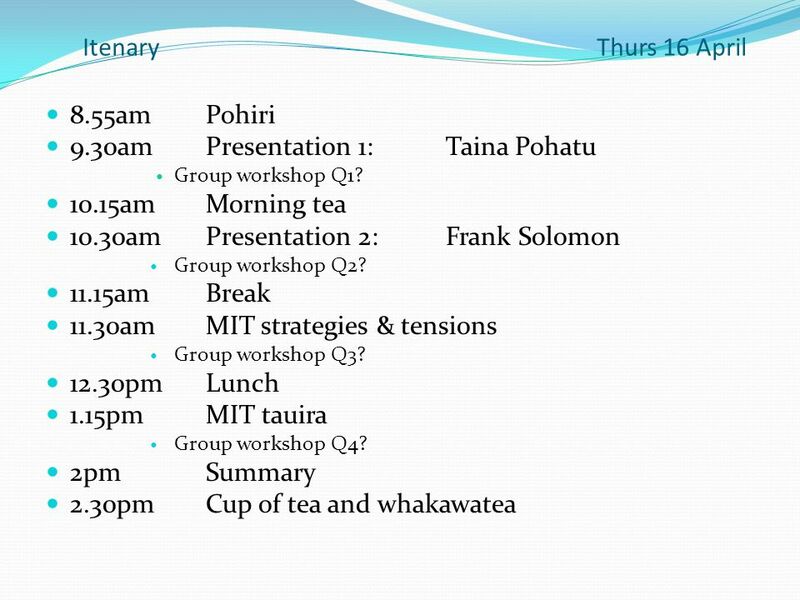 Itenary Thurs 16 April 8.55amPohiri 9.30amPresentation 1:Taina Pohatu Group workshop Q1? 10.15amMorning tea 10.30amPresentation." The Youth Guarantee transforming education. History of the Youth Guarantee A struggling system? Vision What this will look like… Areas of Change Challenges. Shouting it Out! How NZ public libraries are making a noise about music IAML conference Vienna, 1 st August 2013. Working in Partnership to create Learning Environments for the 21st Century Jude Soper, Principal of ACG International School Jakarta. Careers Centre ‘ Good’ placement support: allowing students to combine academic and professional achievements Nalayini Thambar and Clair Souter Assistant. Manukau Institute of Technology Working with Communities Pasifika Development at Manukau Institute of Technology. Youth Action From the shaping the session to leading the organisation. What can libraries learn from Mātauranga Māori. Mātauranga Māori Mātuaranga Māori is a body of knowledge handed down by ngā Tipuna There are many strands. 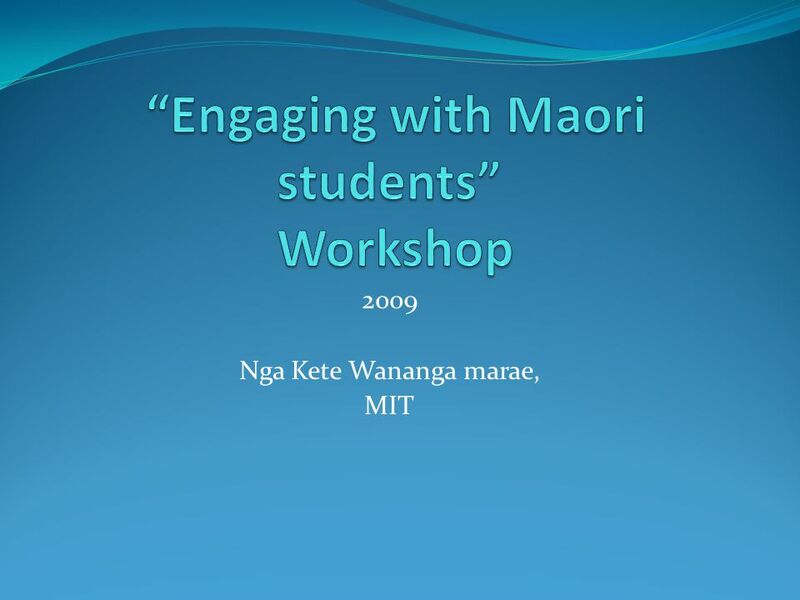 How much support is there for Maori students at MIT? Public engagement and lifelong learning: old wine in a new bottle, or a blended malt? Paul Manners Director, National Co-ordinating Centre for Public Engagement. NZ Principals’ Federation Moot 4 April 2008 Karen Sewell Secretary for Education. Hospitality is the Heart of the Gospel. Wānanga – Mobilising Learning Populations Tākiri ko te ata The breaking of a new dawn T.W. Pohatu 16 March 2009. Te Reo Tauira Learning from Learners – Solving for Success Ivy J. Harper Te Mana Ākonga.